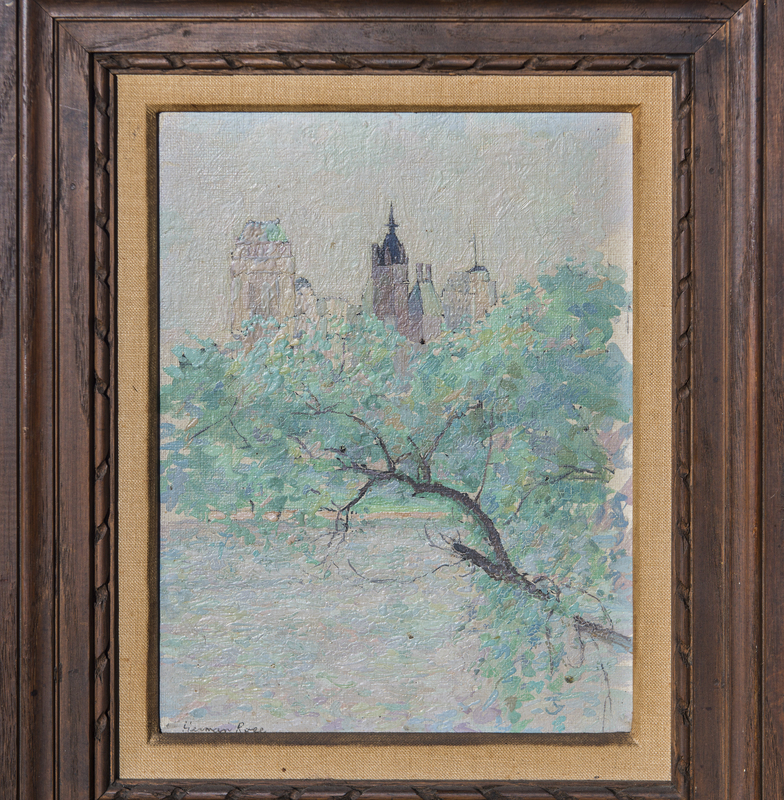 Known for small scale, modernist urban views of New York City, he depicted the city as a jumble of architecture in varying sombre colors in a mood reminiscent of 19th century Romanticism. He had a highly original technique, which was covering a drawing with small dabs of paint and pushing spots of warm and cool color over one another, which dried into a kind of low relief. It took him about a decade, from 1929 to 1939, to arrive at this style and method that seemed right for him. He decided to paint what he saw without consciousness as to style or composition and with spiritual commitment, devoting himself to divinity in nature, separated from the modern world. By the 1960s, he was doing horizontal work in brighter hues that gave the viewer the impression of being swept along a street or urban path. In addition to landscapes in oil, he also painted still lives and works in watercolor and has traveled to New England, Mexico, Spain, Italy, Israel and England for subject matter. Herman Rose was born Herman Rappaport in Brooklyn, New York on November 5, 1909. He studied at the National Academy of Design from 1927 through 1929. From 1934 to 1939 he worked as an assistant to Arshile Gorky in the Works Progress Andministration’s Mural Division. It took Rose 10 years to arrive at his true destiny as a painter. After passing through several 20th century styles, in 1939 he reached a pivotal decision: from this moment on he would paint exactly what he saw without regard to style or composition. His paintings were all quite small and his technique was entirely original. He began using the name Rose when he had his first solo exhibition in 1946. Rose had 20 more solo exhibitions over the following 40 years. In 1952 he was included in “15 Americans” at the Museum of Modern Art in New York, along with Jackson Pollock, Clyfford Still, Mark Rothko, and others. He taught at Brooklyn College from 1949 to 1951; the New School of Social Research in 1954, 1955 and 1963 to 1990; Hofstra College in 1959 and 1960; the Pratt Institute; Queens College; and the University of New Mexico in 1970 and 1971. He was Artist in Residence at the University of Virginia in 1966. Herman Rose died at his home in New York on December 4, 2007, at the age of 98.